I always find myself spending the first few weeks of January using up stray ingredients from the holidays. Half a bag of polenta, candy canes, creme fraiche that I stuck in the freezer until I could think of a use for it. This year, I had a small amount of wild rice left from a casserole and using it as a grain in a meal bowl seemed like a good idea. And it was! Meal bowls are pretty ubiquitous in the food blogging world right now, particularly if you’re vegetarian or vegan. What I love about them is their versatility—we have dinner-in-a-bowl at least once a week because I always have random vegetables and grains in the fridge that need to be used. Typically, I roast the veggies, combine them with a grain or bean, whip up a sauce or dressing, and add fresh greens and garnishes like herbs and seeds. We have an entire post about building a nutritionally balanced meal bowl here if you want to come up with your own ideas. For this particular bowl, I tossed the wild rice in red wine vinegar and olive oil, and used seasonal root vegetables, which pair nicely with the earthy flavor of wild rice. 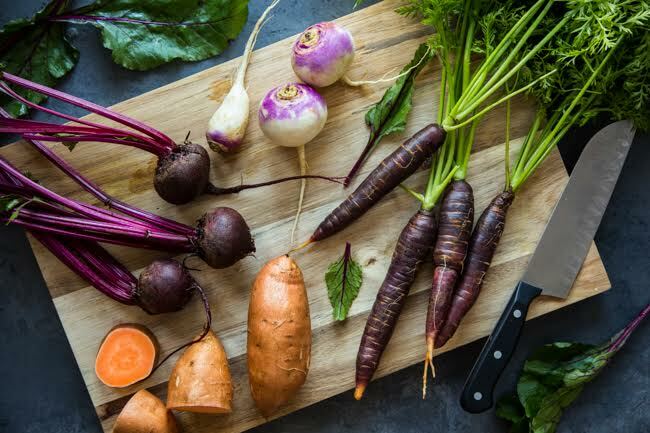 Any root vegetables you like will work. A simple tahini dressing is drizzled over the top and then arugula, pomegranate arils and pepitas are added as a finishing touch. 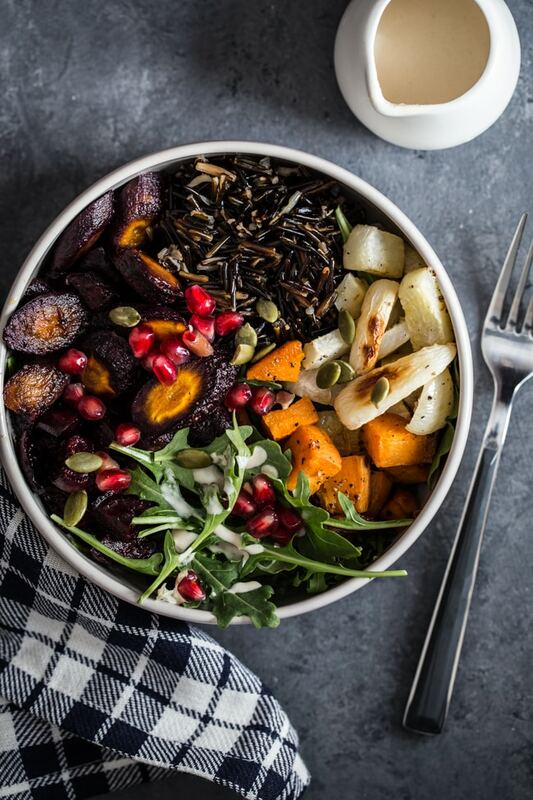 Earthy wild rice pairs perfectly with seasonal root vegetables in these healthy meal bowls. Combine the wild rice with 3 cups of water in a saucepan. Bring to a boil, then reduce to a simmer and cover. After 40 minutes, check to see if the wild rice is tender—because it’s being used in a salad, you want it tender, but still maintaining its shape and some firmness. Drain the rice, then stir in the vinegar and olive oil, and season with salt and pepper. Set aside. While the rice is cooking, preheat the oven to 400ºF and line a rimmed baking sheet with parchment paper. Place the root vegetables on the baking sheet and drizzle with the olive oil. Toss to coat, then season with salt and pepper. Roast the vegetables for about 45 minutes, stirring every 15 minutes or so, or until tender and beginning to brown on the edges. Combine all ingredients in a small bowl and whisk until smooth, adding more water if needed. Divide the wild rice and root vegetables into 4 bowls. Add the greens, dressing, and walnuts or pepitas and pomegranate arils, if using. Serve immediately. yum yum! I need more veggie bowls in my life. But to be honest, I’m missing the meal plans quite a bit… are they coming back or not? Every friday or saturday we are making a meal plan, and I got a lot of inspiration from them! Luckily there is an archive, but still it would be very nice when they are published again. These meals bowls look so earthy and fantastic!! I’m loving the tahini sauce! This is my kind meal!! Roasted root vegetables are the best.